Pierson, M.E. & McNeil, S. (2000). Preservice Technology Integration through Collaborative Action Communities. 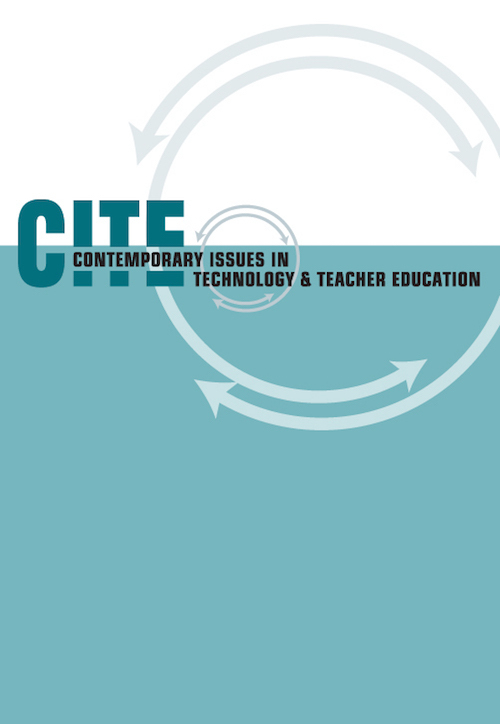 Contemporary Issues in Technology and Teacher Education, 1 (1), 189-199. Charlottesville, VA: Society for Information Technology & Teacher Education. Retrieved April 21, 2019 from https://www.learntechlib.org/primary/p/10808/. Balli, S.J., Wright, M.D., & Foster, P.N. (1997). Preservice teachers' field experiences with technology. Educational Technology, 37(5), 40-46. Barton, J., & Collins, A. (1993). Portfolios in teacher education. Journal of Teacher Education, 44(3), 200-210. Beichner, R.J. (1993). Technology competencies for new teachers: Issues and suggestions. Journal of Computing in Teacher Education; 9(3), 17-20. Bosch, K.A., & Cardinale, L. (1993). Preservice teachers' perceptions of computer use during a field experience. Journal of Computing in Teacher Education, 10(1), 23-27. Carr, L.L. (1992). Integrating technology into preservice education: Determining the necessary resources. Journal of Computing in Teacher Education, 9(1), 20-24. Carroll, J., Potthoff, D., & Huber, T. (1996). Learnings from three years of portfolio use in teacher education. Journal of Teacher Education, 47(4), 253-262. Falba, C.J., Strudler, N., Bean, T.W., Dixon, J.K., Markos, P.A., McKinney, M., & Zehm, S.J. (1999). Choreographing change one step at a time: Reflections on integrating technology into teacher education courses. Action in Teacher Education, 21(1), 61-76. Guillaume, A. M., & Yopp, H. K. (1995). Professional portfolios for student teachers. Teacher Education Quarterly, 22(1), 93-101. Handler, M. (1993). Preparing new teachers to use computer technology: Perceptions and suggestions for teacher educators. Computers in Education, 20(2), 147-156. Hirumi, A., & Grau, I. (1995). A review of computer-related state standards, textbooks, and journal articles: Implications for preservice teacher education and professional development. Journal of Computing in Teacher Education, 12(4), 6-17. Hoelscher, K. (1997). The road ahead: Preservice educators' ideas for using technology in K-6 classrooms. Computers in the Schools, 13(1/2), 69-75. Khan, J. (1997). Technology-rich teacher education: Meeting the NCATE challenge. Journal of Computing in Teacher Education, 13(2), 24-29. Lawler, T. (1985). Doing research that is useful for theory and practice. San Francisco: Jossey Bass. Marcinkiewicz, H., & Wittman, T. (1995). From preservice to practice: A longitudinal study of teachers and computer use. Journal of Computing in Teacher Education, 11(2), 12-17. McKinney, M. (1998). Preservice teachers' electronic portfolios: Integrating technology, self-assessment, and reflection. Teacher Education Quarterly, 25(1), 85-103. Mowrer-Popiel, E., Pollard, C., & Pollard, R. (1992). An analysis of the perceptions of preservice teachers toward technology and its use in the classroom. Journal of Instructional Psychology, 21(2), 131-138. Munday, R., Windham, R., & Stamper, J. (1991). Technology for learning: Are teachers being prepared? Educational Technology, 31(3), 29-32. Northrup, P.T., & Little, W. (1996). Establishing instructional technology benchmarks for teacher preparation programs. Journal of Teacher Education, 47(3), 213-222. O'Bannon, B., Matthew, K.I., & Thomas, L. (1998). Faculty development: Key to the integration of technology in teacher preparation. Journal of Computing in Teacher Education, 14(4), 7-11. Office of Technology Assessment (1995). Teachers and technology: Making the connection. Washington, D.C.: U.S. Government Printing Office. Oliver, R. (1994). Factors influencing beginning teachers' uptake of computers. Journal of Technology and Teacher Education, 2(1), 71-89. Persky, S.E. (1990). What contributes to teacher development in technology? Educational Technology, 30(4), 34-38. Rodriguez, S. (1996). Preparing preservice teachers to use technology: Issues and strategies. TechTrends, 41(4), 18-22. Snyder, J., Lippincott, A., & Bower, D. (1998). The inherent tensions in the multiple uses of portfolios in teacher education. Teacher Education Quarterly, 25(1), 45-60. Sprague, D., Kopfman, K., & Dorsey, S.L. (1998). Faculty development in the integration of technology in teacher education courses. Journal of Computing in Teacher Education, 14(2), 24-28. Stringer, E. (1999). Action research: A handbook for practitioners. (2nd Ed.). Thousand Oaks, CA: Sage. Strudler, N., Quinn, L.F., McKinney, M., & Jones, W.P. (1995). From coursework to the real world: First year teachers and technology. In D. A. Willis, B. Robin, & J. Willis (Eds. ), Technology and teacher education annual, 1995. Charlottseville, VA: AACE. Thomas, L. (1994). NCATE releases new unit accreditation guidelines: Standards for technology are included. Journal of Computing in Teacher Education, 11(1), 5-7. Thomas, L. (2000, March). NETS project update. ISTE Update, 12(6), 1, 5. Van Gorp, M.J. (1998). Computer-mediated communication in preservice teacher education: Surveying research, identifying problems, and considering needs. Journal of Computing in Teacher Education, 14(2), 8-14. Wade, R.C., & Yarbrough, D. B. (1996). Portfolios: A tool for reflective thinking in teacher education? Teaching and Teacher Education, 12, 63-79. Wetzel, K. (1993). Teacher educators' uses of computers in teaching. Journal of Technology and Teacher Education, 1(4), 22-27. White, C.S. (1994). Technology in restructured preservice education: School/university linkages. Journal of Technology and Teacher Education, 2(2), 119-128. Wiebe, J.H., & Taylor, H.G. (1997). What should teachers know about technology? A revised look at the ISTE foundations. Journal of Computer in Teacher Education, 13(4), 5-9. Willis, E.M. (1997). Technology: Integrated into, not added onto, the curriculum experiences in preservice teacher education. Computers in the Schools, 13(1-2), 141-53. Zachariades, I., & Roberts, S.K. (1995). A collaborative approach to helping teacher education faculty model technology integration in their courses: An informal case. Journal of Technology and Teacher Education, 3(4), 351-57.